Speaking to reporters, Pinarayi Vijayan said the people of Kerala and Tamil Nadu are like brothers and stressed on talks to put an end to the water-sharing disputes. 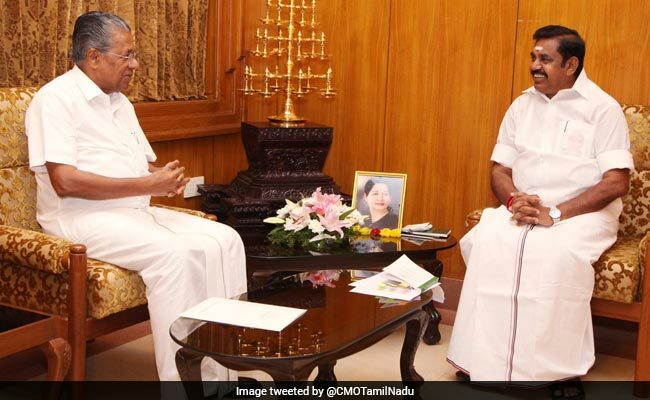 Chennai: Kerala Chief Minister Pinarayi Vijayan today called on his Tamil Nadu counterpart K Palaniswami here and the two decided to hold official-level talks to solve the water disputes between the two states. A press release of the Tamil Nadu government described Mr Vijayan's meeting with Mr Palaniswami as a "courtesy call". At the meeting, "they decided to hold official-level talks towards solving the inter-state water sharing disputes", it said. "Officials from the two states will soon hold talks," it added. Later, speaking to reporters, Mr Vijayan said the people of the two states were like brothers and stressed on talks to put an end to the water-sharing disputes. The two neighbouring states are locked in a row over the Mullaperiyar dam with Kerala raising apprehensions over the safety of the over-a-century-old structure. Though located in the Idukki district of Kerala, the dam is owned and operated by Tamil Nadu, as per an 1886 lease agreement. It irrigates several southern districts of Tamil Nadu. In May 2014, the Supreme Court had held that the dam was safe and allowed Tamil Nadu to raise the water level to 142 feet and ultimately to 152 feet, after the completion of the measures to strengthen it further. Tamil Nadu had earlier this year moved the apex court, alleging that Kerala was not allowing it to maintain the dam. Other water-sharing disputes between the two states include the Parambikulam-Aliyar Project (PAP) with Kerala accusing "violations" by Tamil Nadu, and the Neyyar river dispute.